Margaret Elsie Booth, the sixth in a family of eight, the children of Richard Thornton and Elsie Edge Booth was born at Alpine, Utah, September 1, 1859. Her parents were English converts to the Church, who saved from their meager earnings over a period of ten years enough money for their immigration. The father was a cripple having deformed his legs through long years of operating a foot driven weaving loom. There were four children in the family as it set sail from the old country in May 1857. Three weeks were spent on the ocean. They outfitted for the trip across the plains at Council Bluffs. A fifth child was born during the trek at Big Sandy, Wyoming. The first winter in Utah was spent in Salt Lake City. In the spring of 1858, the family roved to Alpine where a "dugout" home was their first shelter. 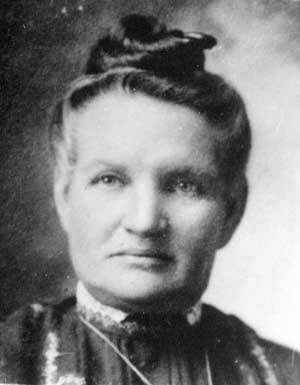 Margaret Elsie was the first child to be born to this family in Utah. She was raised to womanhood in a home where progression, unselfishness, sympathy, faith, and love prevailed. In her girlhood she took a large share of the household responsibilities. She completed the schooling offered in the little rural town of Alpine and two terms at the Brigham Young Academy at Provo. Margaret was a favorite among her associates because of her cheerful and fun-loving disposition. Her ability to entertain made her welcome in any society. An account of her marriage and the various moves of the family are included in her husband (Christopher Hackett)'s history and so will not be repeated here. She had unbounded faith in her church and filled many responsible positions with ability and devotion. She was counselor in the first Y.W.M I.A. in Alpine; first counselor in the Alpine Stake Primary, President of the Alpine Ward Primary, President of the Alpine Hard Relief Society; counselor in the Arimo, Idaho, Relief Society; a choir member for many years; theology leader in the Lehi Fifth Ward Relief Society. She with her husband did much endowment work for the dead. Margaret was sorely tried and tested during her husband's mission absence. She was left with a family of eight children and another to be born. May was married at this time and Edna, eldest in the family, was teaching school at Lehi. Without her earnings, small though they were, the mission would have been very difficult, more so than it was. Edna kept out of her check each month barely enough for her own expenses. The remainder, which was the lionís share, was sent to her father or given to her mother. Margaret Hackett's home was always open to either relative or stranger. Although in the most modest circumstances she offered the visitor the best the home afforded. She was kind, sympathetic, generous. Her true nature came to the front in her care of the sick. She had qualified as a practical nurse and as such her services were much in demand in the small community where she lived as there was no resident doctor there. Her chief service was in connection with maternity cases. Often in emergencies, she was the soul attendant. She was also called upon for all sorts of illnesses following in the footsteps of her father who for many years was Alpine's only practitioner. He served without pay and furnished medicines gratis as well. Although Margaret's charges were moderate in the extreme, many failed to appreciate her services by paying her fees. Whatever she lacked in medical skill, she made up in the cheerful and optimistic spirit she brought into the home. Another severe test came to Margaret with the death of her son Richard who died in France at the close of World War I just as his regiment had been given orders to embark for home. He had contracted influenza. What gave Margaret most grief was that her son was buried on foreign soil. She never regained any appreciable peace of mind until the body was brought home and interred in the Alpine cemetery. 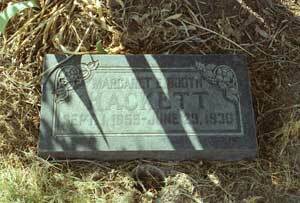 Due to a diseased goiter Margaret developed heart trouble which ended in her death at her home in Lehi, June 29, 1930. Burial was also in the family plot at the Alpine cemetery. Her surviving children included the ten listed in her husband's history with the exception of Richard.